Typhoon Hagupit: Women will carry the real cost of humanitarian crisis. Typhoon Hagupit has swept through The Philippines, but it will take some time to get a full picture of the damage it has wrought. Whilst the successful evacuation of hundreds of thousands meant far fewer casualties than that of Typhoon Haiyan, the fact is that many people have lost their homes and face an uncertain length of time in evacuation centres and temporary shelters. This situation presents a myriad of challenges to communities, most especially to women and girls. 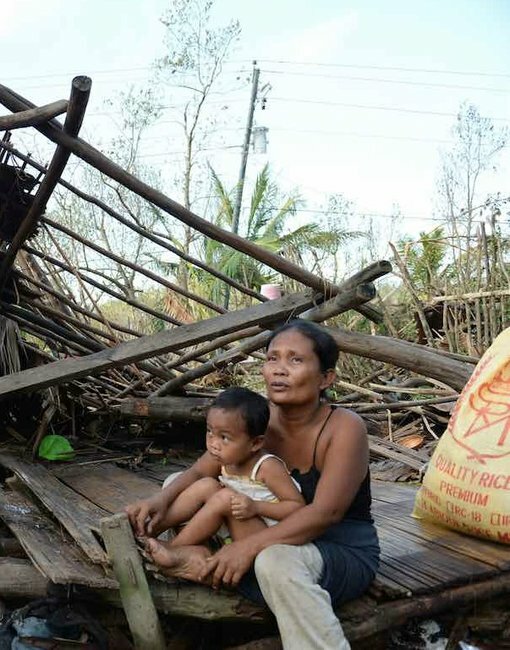 A mother and child sit in the aftermath of Typhoon Hagupit. Image via Getty. Humanitarian crises – whether caused by natural disaster or armed conflict – always hurt women and girls the most. Women and girls are often the most vulnerable before a disaster and this vulnerability increases in time of emergency. It’s a sad fact that in times of upheaval, gender based violence increases. For when there is prolonged displacement because of damage to homes, there is a heightened risk of violence against women due to the social instability that follows a disaster. Maternal health and family planning services often become unavailable after an emergency, putting pregnant, breastfeeding women, and women of reproductive age, in a precarious situation. It is critical that agencies responding to emergencies are aware of these issues and plan accordingly, not only to ensure their responses meet the specific needs of women and girls but also to protect from additional harm. This was brought home to me when I was part of the Oxfam response to Typhoon Haiyan in Eastern Samar last year. The typhoon left more than 6,000 dead and 4,000,000 displaced in its wake when it hit on 8 November. 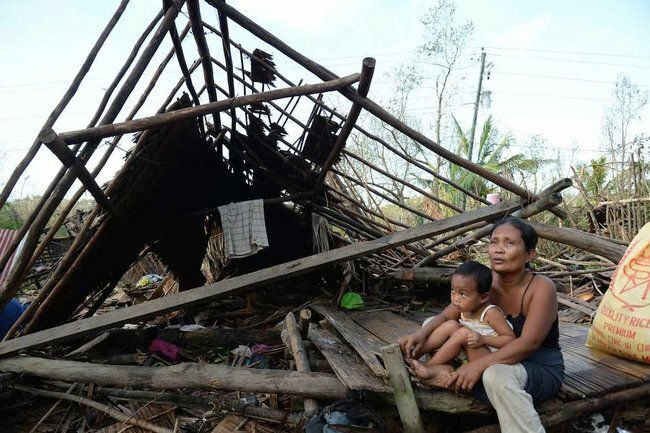 The typhoon destroyed thousands of homes and people spent months living under tarpaulins and tents whilst they rebuilt their lives. Of those displaced, an estimated 250,000 women were pregnant, while many more were caring for young children and still breastfeeding. As you can imagine, trying to look after your own health as well as the health of infants in these situations is incredibly challenging. The Philippines Government moved some families to ‘bunkhouses’ – large temporary shelter sites which provided shelter, but little else. Many of the bunk houses did not have access to water or toilet facilities and lacked proper bathing and kitchen facilities. 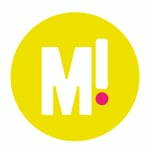 This made it especially hard for women who are often responsible for the cooking and laundry. What’s needed: Emergency water pumps. (Image via Oxfam). Fortunately, I have seen first hand that there are some easy, practical things that can be done to reduce risks and make it (slightly easier) for women and children in the aftermath of an emergency. Something as simple as building separate, lockable toilet facilities for women and men can reduce the risk of violence against women and girls. Lighting at toilets is incredibly important too, as it provides safety and security to those using toilets at night. After an emergency, the distribution of hygiene kits to meet with the specific needs of women, men, boys and girls, including infants, can restore dignity. The kits that Oxfam distributed in the Philippines include specific items for women such as sanitary pads, underwear and malongs (body wraps). Both women and men use malongs when washing themselves in order to gain some privacy. Oxfam also provided kits to pregnant and breastfeeding women, with the purpose of addressing specific hygiene needs of mothers and newborns but even more so, to encourage women to undergo pre or post natal check ups. Also required: Temporary safe latrines. (Image via Oxfam). 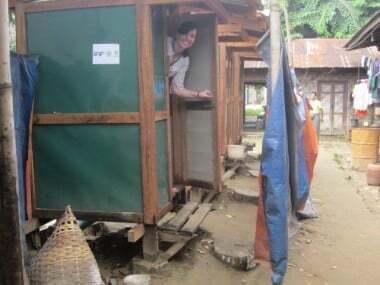 In bunkhouses in Eastern Samar, we helped construct kitchen and laundry facilities and gave out cooking sets – making the day to day life of women easier – as well as supporting women’s groups to set up ‘safe spaces’ focused on providing information and basic emotional support to survivors of a disaster. Unfortunately, in the aftermath of Hagupit, in Samar just this week, our teams have found evacuation centres that have no separate bathrooms for women and girls, resulting in limited privacy as well as hygiene issues. Proof that it’s a constant struggle to keep these issues front and centre of any emergency response. As the media gaze inevitably heads away from The Philippines, let’s not forget what needs to be done to ensure women and girls are not thrust deeper into poverty and unsafe conditions the next time a disaster, anywhere, rolls around. To donate to Oxfam’s International Crisis Fund, please click here.